A holistic charging infrastructure provides a variety of benefits for companies. This lets companies integrate charging processes as well as facilitate accounting and the integration into already existing company processes. 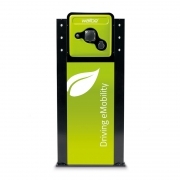 Offers around eMobility therefor evolve from a mere image to a real alternative of conventional combustion engines. 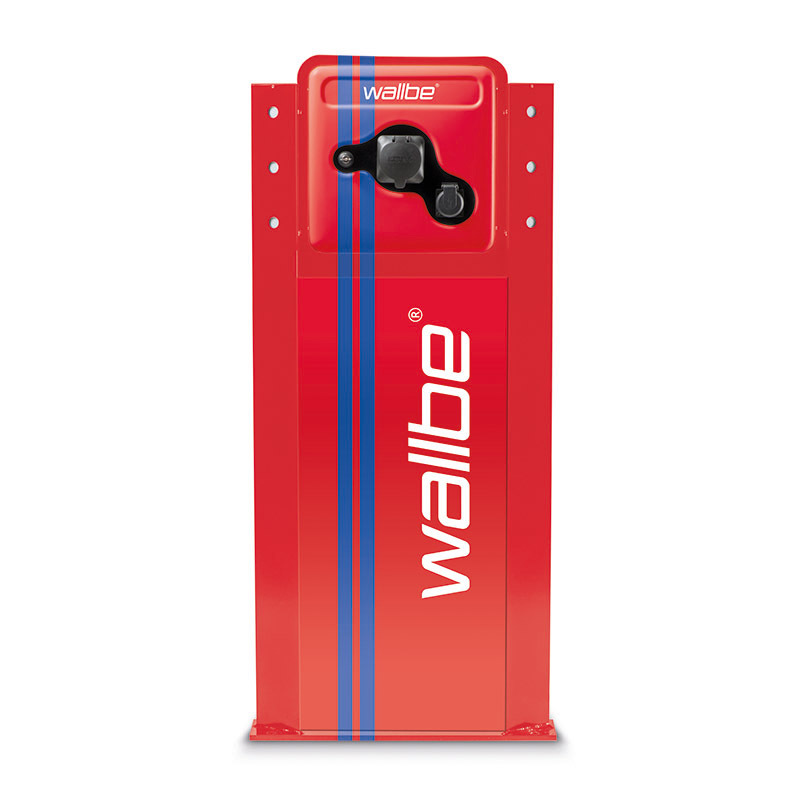 wallbe® paves the way for new opportunities to operate fleet management more flexibly and efficiently. 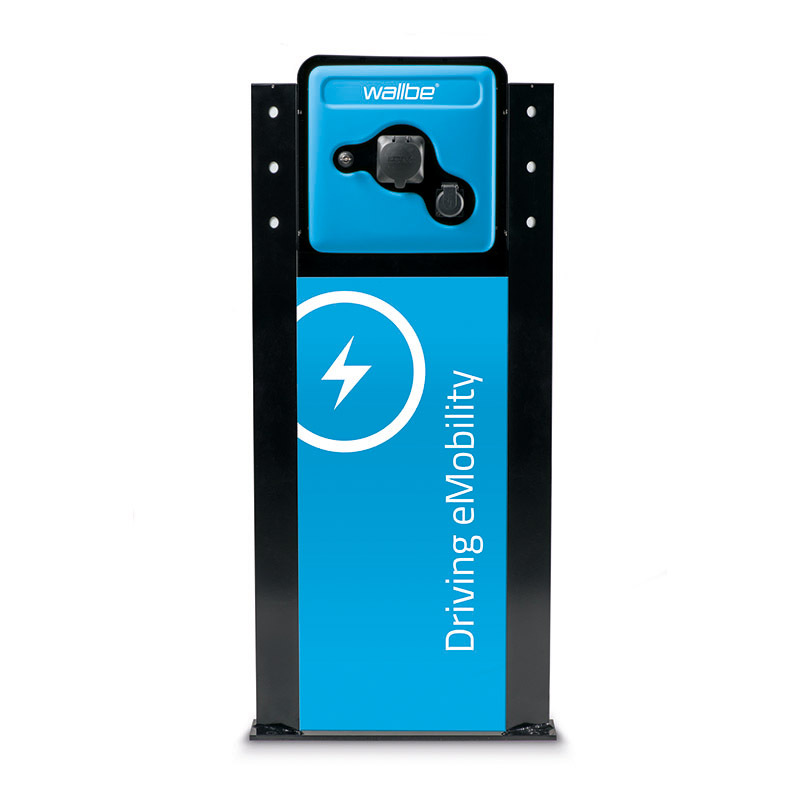 Economical charge management of electric vehicles can be realised particularly easy with wallbe® solutions. 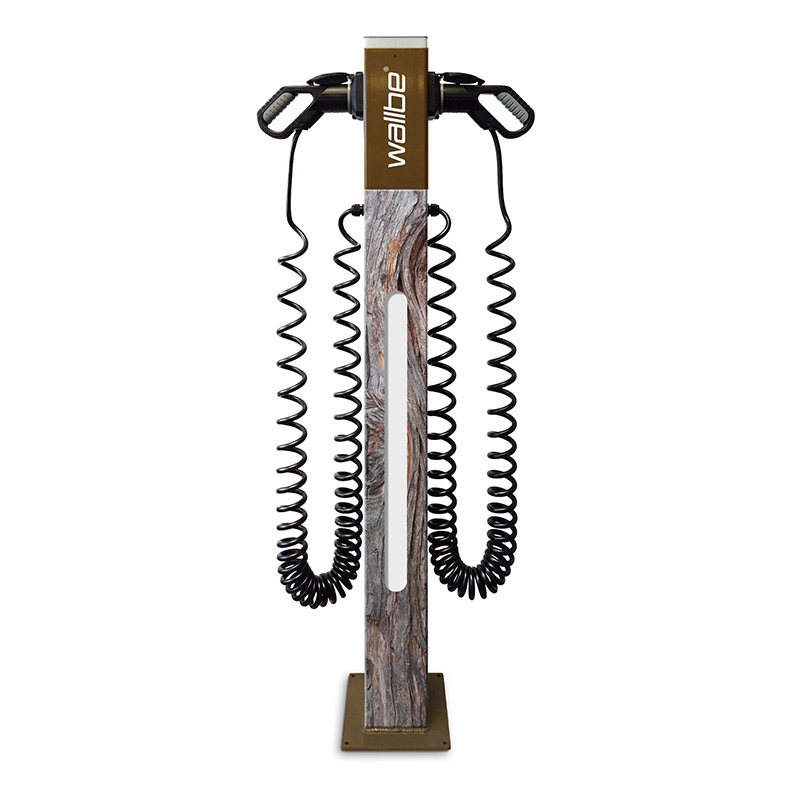 From the charging process to the integrated billing, everything is as comfortable and transparent as possible. Information regarding the energy consumption and the costs are available in real time at any time. Standardised interfaces enable the seamless processing and integration into common management and accouting systems (OCPP). Where ever an electric vehicles stands it should be charged. This especially applies to parking spots on company property. 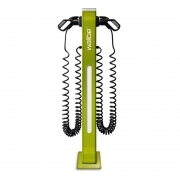 Employees can comfortably charge their vehicles which simply requires an RFID-Card that is assigned to the vehicle. In that way the consumed energy and the corresponding costs can be invoiced. This is also possible across multiple locations. Aside from vehicles in the fleet the charging infrastructure can be also be offered to external vehicles. 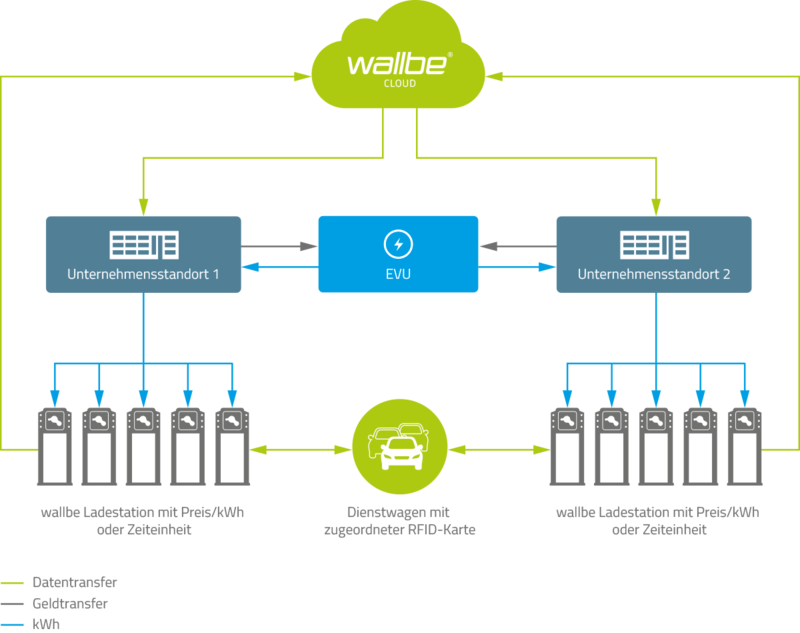 The wallbe® Cloud records the consumption data as well as costs and provides the integration into payment and accounting systems (OCPP). This lets you optimize the load and profitability of your own charge network. The versatile accounting features cover all requirements of a professional fleet management. In that way the costs can be assigned according to different models. Accounting concept for one or more company locations. The RFID-Card is assigned to the company vehicle. That vehicle charges at any of the companies charging stations. 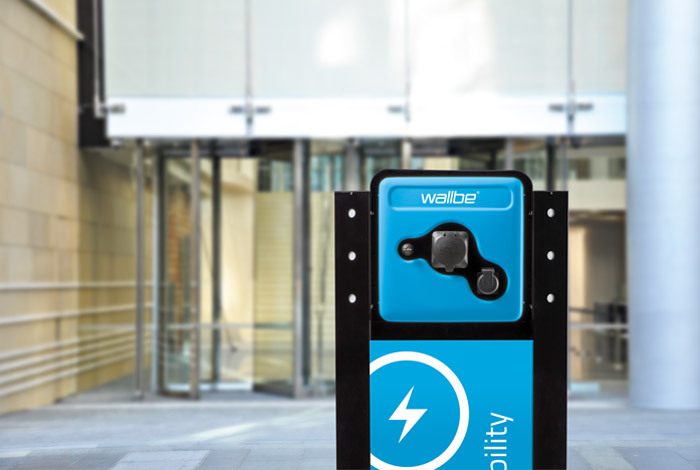 The company receives a transparent insight into the wallbe Cloud where energy costs can be directly assigned to the vehicle via the RFID-Card. If needed the employee can be invoiced. This solution can be integrated across different company locations. 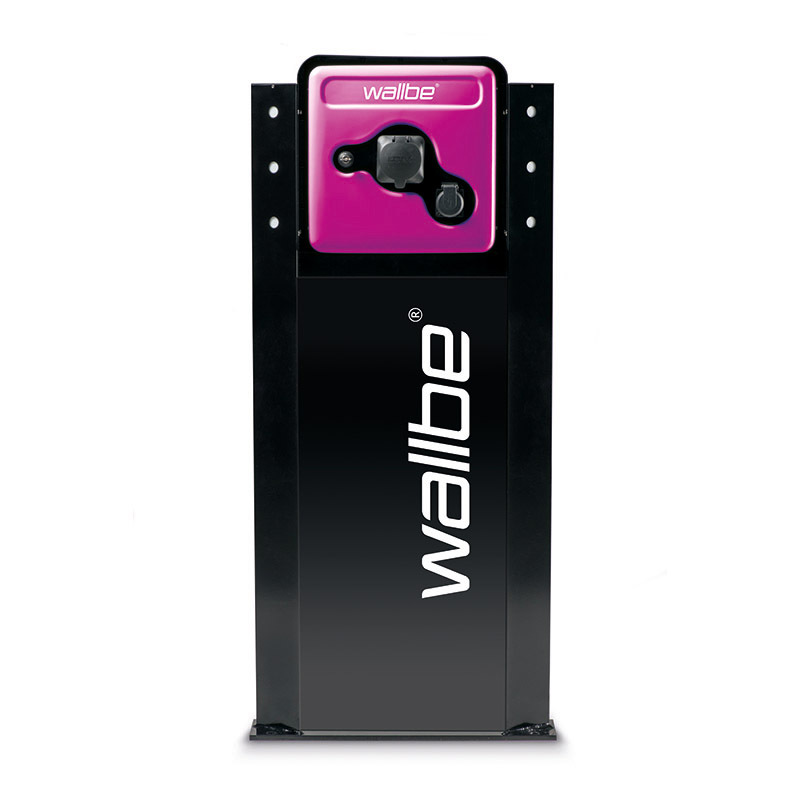 Employees with company owned vehicles simply require an authorisation via RFID-Card or wallbe® App. This lets you use all available charging stations within your companies charging infrastructure. This ranges from private charge points at home to company owned charging stations at any location as well as the whole public charging infrastructure. 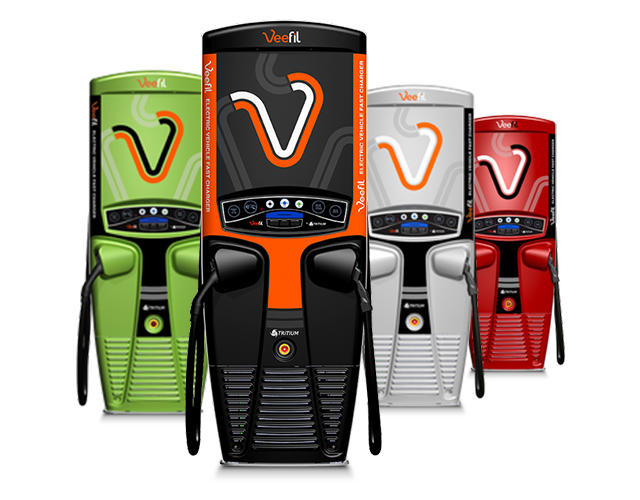 Drivers profit from a comfortable access to all charging stations for their vehicles as well as the automated accounting without a direct payment transaction. Where ever field personnel use private charging stations, these privately paid energy costs will be monitored via the wallbe® Cloud and the employee receives a credit. The company refunds the consumed kWh with a monthly bill. Tax relevant models can also be applied if the employee uses the vehicle for private purposes. In that case the consumed energy on a business matter and private use will be calculated accordingly and invoiced if necessary. The corresponding accounting methods can be individually defined in the wallbe® Cloud. An employee charges his company vehicle at home via his own charging station and receives an invoice from his energly supplier. The employee transmits the kWh price of his contract to wallbe. The charged kWh amount will be transmitted in real time. 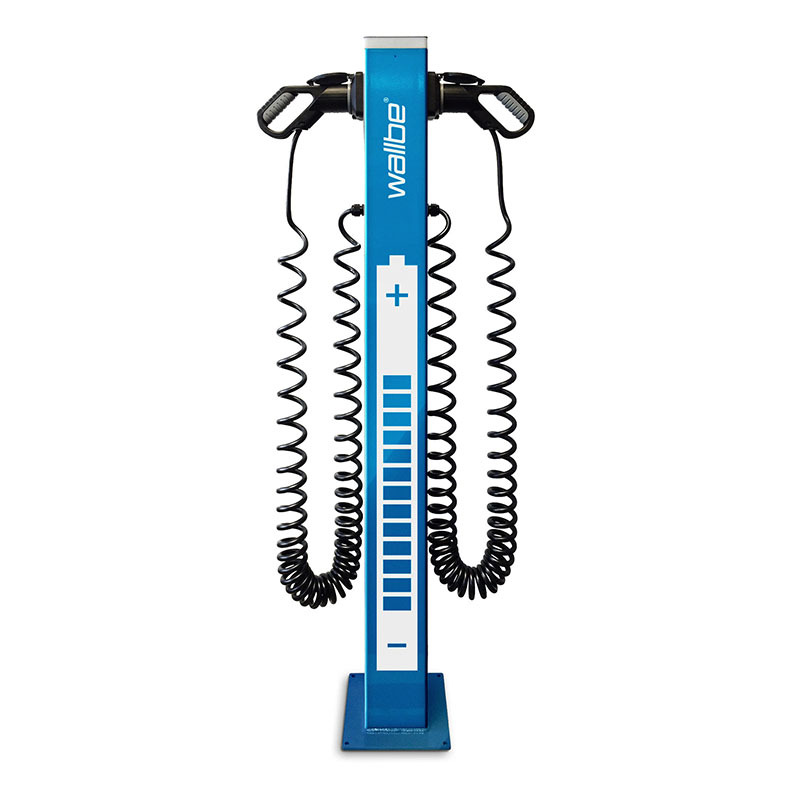 This grants insight into how much energy the company vehicle requires and the arising costs. 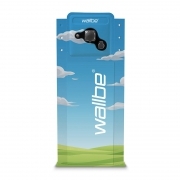 wallbe sends a credit note to their employee including the privately paid energy for their company vehicle. The employer receives the information how much energy which employee has private paid to charge his company vehicle. 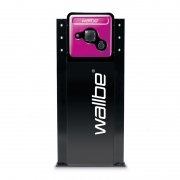 The employee pays the costs of the privately charged kWh through their employee to wallbe. 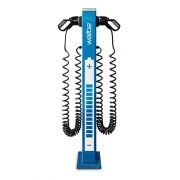 At company locations employees charge using their companies RFID-Cards. These information are also transmitted into the wallbe Cloud. 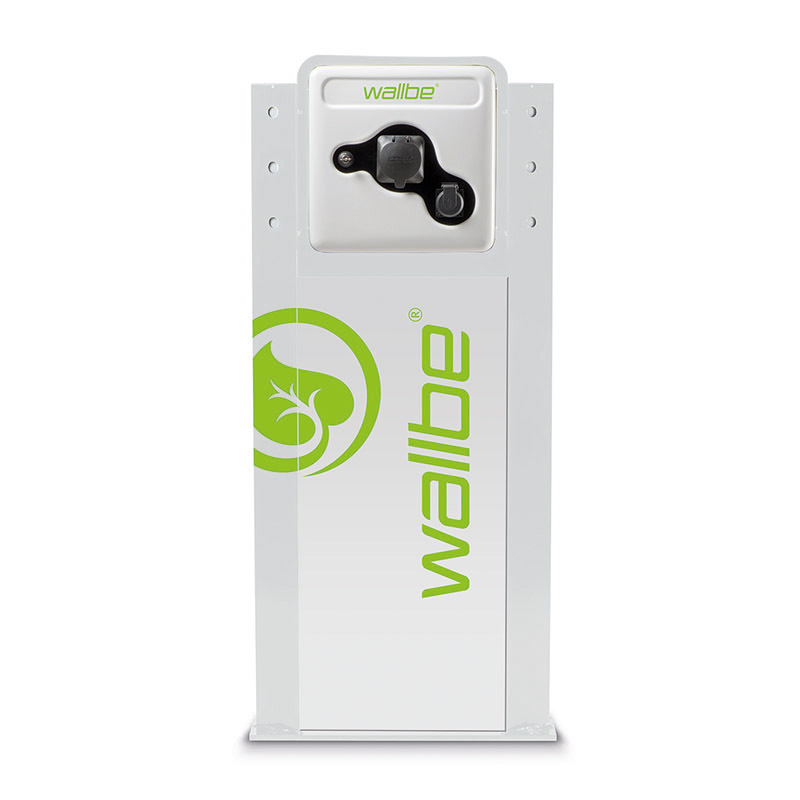 All data concerning all charge events are available in the wallbe® Cloud at any time in real time. 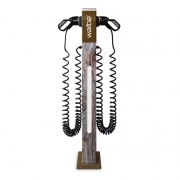 From the charged kWh to charge locations, times, duration as well as costs. This high transparency helps to efficiently use company vehicles and optimise the fleet management. 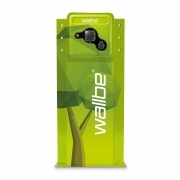 In connection with the wallbe® Cloud all suitable charging stations on the route are visible. This also helps to immensely increase the range of field personnel without expanding further detours. 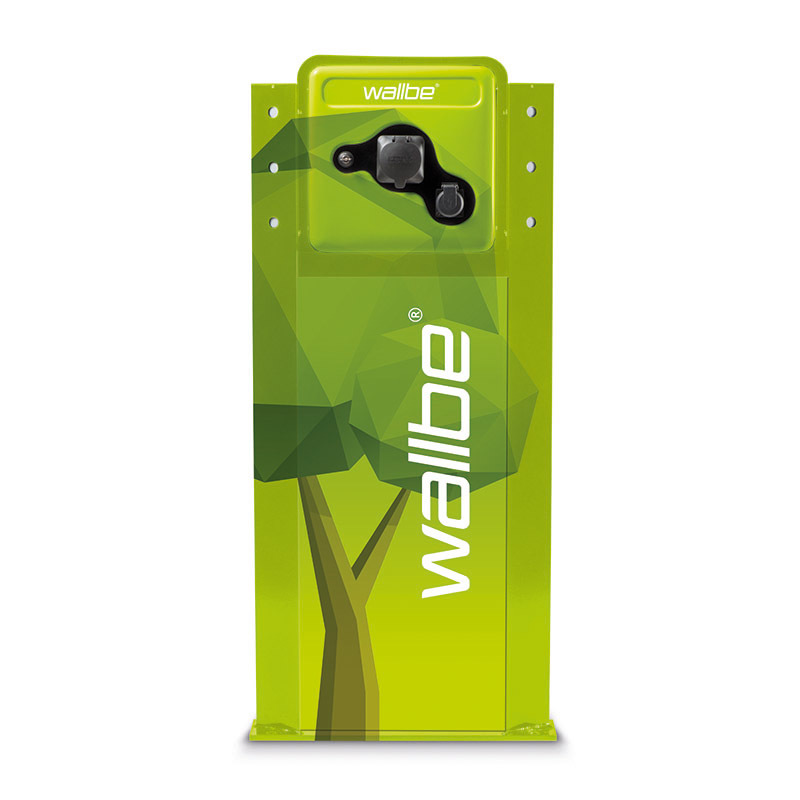 All components and requirements to operate charge-networks are completely covered and available by wallbe®. 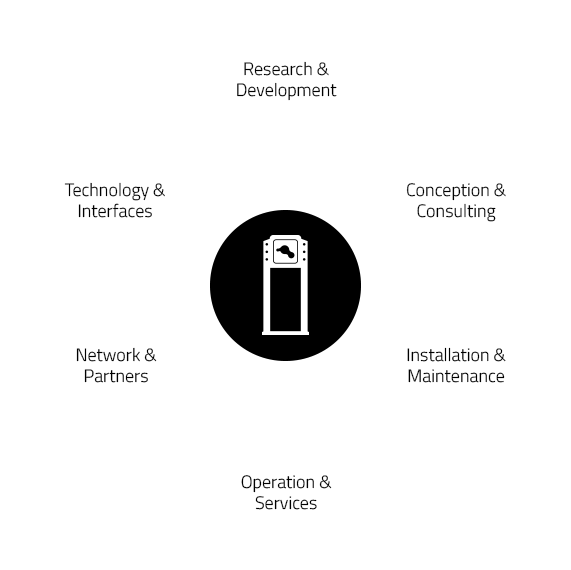 Proven products and holistic services, which are seamlessly working together, keep installation and mainentance costs at a low level. 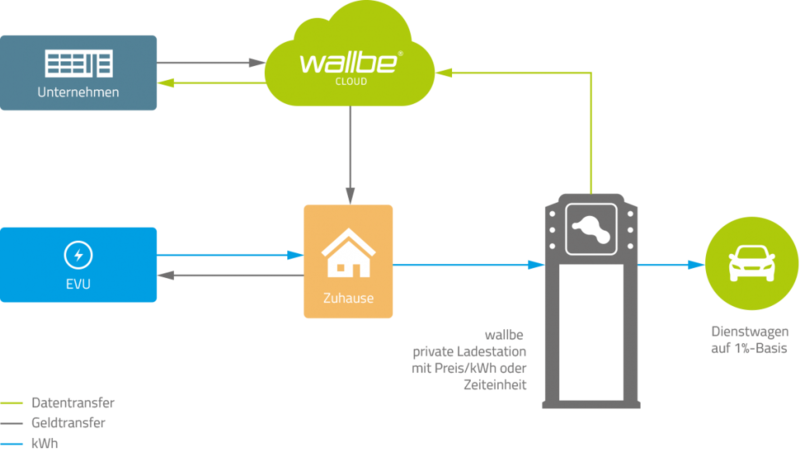 The wallbe® Cloud connection ensures a reliable monitoring of the whole charging-inrastructure. Availability and system stability are therefore tremendously high. Interfaces to established Backend-, Payment- or Accounting-systems are the optimal qualification for a seamless integration into corporate processes. With the flexible charge and load management from wallbe® the energy will be intelligently and demand oriented distributed. Renewable energy of photovoltaic energy plants, wind energy, bio gas, or excess energy of other energy plants can be used to supply the charging infrastructure. wallbe® solutions optionally come with a dynamic load management. This makes sure that the charge performance never exceeds the ampere threshold leading to unplanned costs. In case the energy grid is at its supply limits the next charging process will be started after the last one has been stopped. 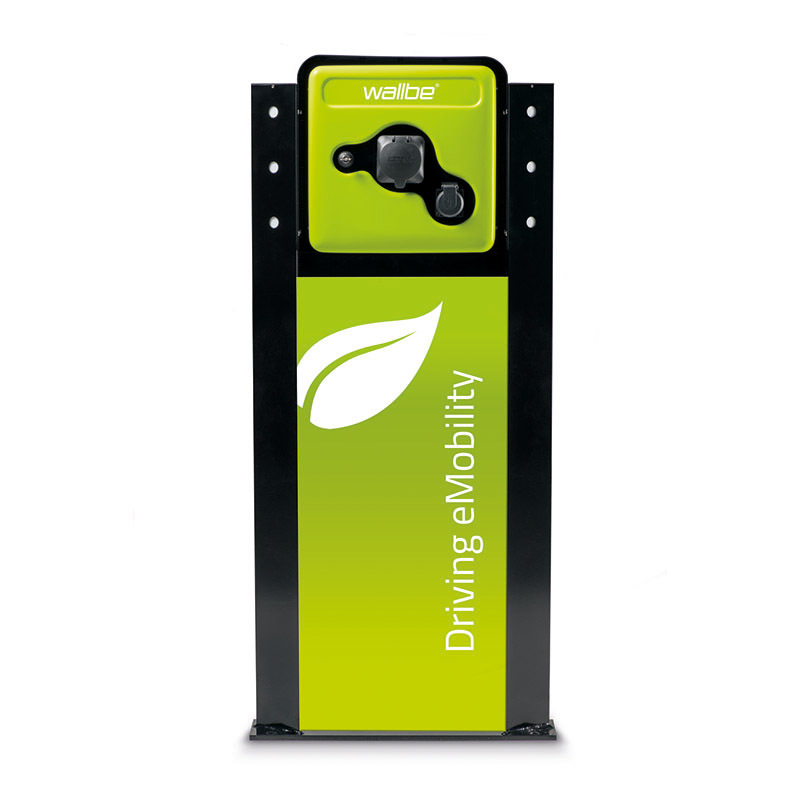 Our solution connects all devices, services and processes to efficiently organise the operation and accounting of electric vehicles. In that way we can guarantee that all components are optimally matched according to our customers requirements. Automated monitoring of energy costs and charging processes of all electric vehicles in real time.